If you’re in the majority of the general population, odds are that you’re thinking about organizing your life and eating healthier in the new year. I know that I am! For me, getting organized starts with meal planning. Dinnertime is always the most hectic time of the day, and if I don’t have a solid plan I can easily end up putting everyone on “fend for yourself mode” and leaving them to dig out leftovers or make their own deli sandwiches. Even worse, I’ll skip at-home dinner prep altogether and order out from a local restaurant or take a trip through a high calorie drive thru. To save myself the time and stress, I put together a dinner menu that will carry me through the entire month. I included meals that my picky kiddos will (hopefully!) eat and lots of chicken recipes since that’s what we eat the most. 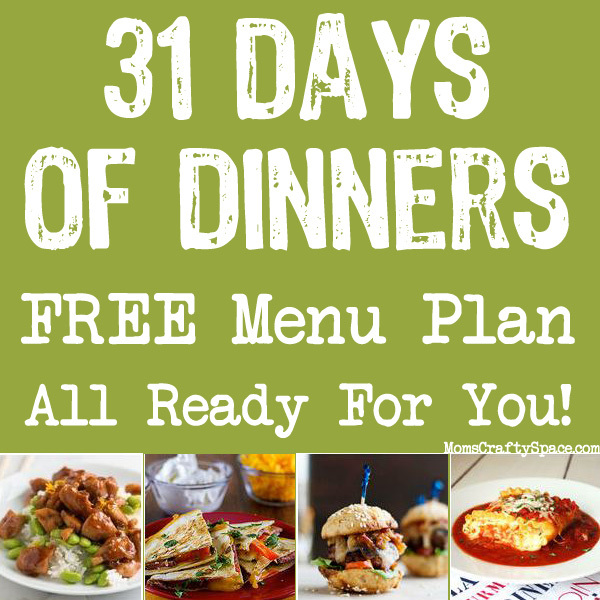 Now when dinnertime rolls around I just take a quick glance at my monthly menu and easily see what’s for dinner. Bonus: when your meals are pre-planned, it makes grocery shopping so much easier. If you stop buying lots of random food without having a real plan for it, you’ll save yourself a ton of money and waste! This is awesome! Great idea to use a linky party to set it up. Everything looks delicious. I can’t seem to find the menu plan, where exactly do I click? Is it all in the “Related Posts”? or is there actually a calender/ list? Have you considered including a shopping list with these meal plans? I would seriously be on your page constantly if you did! These meals look delicious, but I don’t have time to go through each recipe to create a monthly shopping list.